C4S6CD6 My iTunes library tells that I have 1109 different artists in my collection which surprised me, but if I had to list my top ten then Tom McRae would always feature in it. Where he features in that list might vary from time to time but I couldn’t imagine ever being without his music. The first thing that struck me when I pulled this CD off the shelf is that Tom has short hair that may sound weird but it’s a very young looking Tom that is featured in the slip case and then I realised that this album was released in 2002, nearly 10 years ago which makes the maturity that you will find in the music even more remarkable. So the music where do I start? Well maybe the aforementioned You Only Disappear which is still my favourite Tom McRae song, I won’t attempt to interrupt Tom’s lyrics but to me it’s a song about a lost love and one of the most beautiful songs I own. Anybody lucky enough to have seen Tom live may have seen him open a show with Mermaid Blues unaccompanied, with nothing but Tom voice and a silent audience this is an incredible experience and a moment of live music I count myself lucky to have witnessed. On the Album Mermaid Blues is followed by Karaoke Soul and back to back make a killer combination. Other highlights for me are Ghost of a Shark and Walking 2 Hawaii but I could, and have, waxed lyrically about this album and Tom McRae for hours so I’ll stop there. 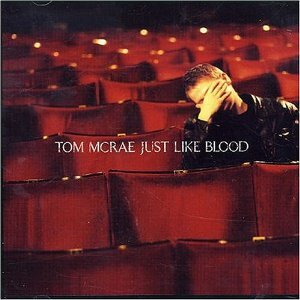 Tom McRae is presently without a record label which is a crime, but he continues to make music (and many other items) available through his website. His live performances are brilliant with Tom’s bone dry sense of humour making the evening 3 parts musical genius and 1 part stand up comedian. I’ll finish this blog with an apology, I know Tom followers me on twitter (whether he reads my tweets is another thing), but if you are reading this Tom hopefully I have done you album justice and if not I apologise profusely.